Xavier Marmier, Dutch poetry in translation and Hieronymus van Alphen. In 1841 Xavier Marmier published his Letters on Holland (Lettres sur la Hollande). Marmier wrote travel literature and carried out translations, for instance, from German into French. His fi nal judgment on Dutch literature is not favourable, mostly because he thought Dutch poetry lacked passion. Nevertheless, in 1836 he had already published The friend of small children (L’ami des petits enfants), a children’s book of short stories in prose, which included translations from the very successful poems for children by the Dutch author Hieronymus van Alphen. A few years earlier these poems had also been translated into French verse by Auguste Clavareau, born in Luxemburg, who was convinced that Dutch literature should be known in other countries as well. His translations, however, were mostly bought by Dutch readers. ‘A vivid example’. Contact and transfer between socialists in the Netherlands and Belgium around 1880. This article explores how research on international contacts may contribute to the study of transfers, taking as a case-study the trip of the former Dutch clergyman and socialist leader Ferdinand Domela Nieuwenhuis to the Belgian city of Ghent in 1879. Current research on transfers focuses mainly on the international exchange of ideas but research on the practical side of transfers shows there are other important factors – such as personal contact, friendship and status – that may be overlooked when focusing solely on ideas. This is demonstrated in the way Domela Nieuwenhuis and the early Dutch socialists made use of their international contacts. From Schollevaarseiland to Naardermeer. Changing visions of the disappearance of nature in the Netherlands, 1860-1900. From 1860 onwards various authors reported in Dutch magazines about fi eld trips to a natural phenomenon that they took to be on the brink of extinction in the Netherlands. Seeing this large colony of nesting birds, living in a wetland lake between the cultivated areas of Holland and Utrecht, was a rare last chance of seeing wildlife as it would have been in the undisturbed marshlands of ancient Holland. Reporters like the academic zoologist Pieter Harting, the landscape painter Willem Roelofs and the secondary school teacher J.A. Bientjes all published their experiences for a general audience. Readers were urged to visit this spectacle soon, before the ongoing process of land reclamation drained the lake. By following these published reports over time, we can see changes in the appreciation of the idea that the last remnants of this ‘original’ natural landscape would soon disappear. ‘Underneath the smoke of the Capital’. 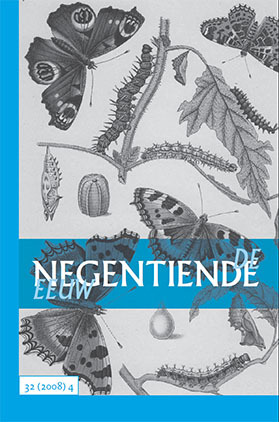 The representation of city, nature and countryside in the series Van vlinders, vogels en bloemen [About butterflies, birds and flowers] by E. Heimans and Jac.P. Thijsse. Because of the widespread fin-de-siècle belief in an opposition between the dirty, immoral city and the healthy countryside, one would expect this to be the dominant theme in Heimans and Thijsse’s Van vlinders, vogels en bloemen [About butterflies, birds and flowers] (1894-1901), a series of biology books written for children to encourage them to discover the wonders of nature outside the city walls. Surprisingly, Heimans and Thijsse focus on the similarities between city and nature. They believe in an undefined metaphysical force that controls the harmonic development of all life, both in city and nature. In their eyes only the city man has the scientific and cultural knowledge to fully appreciate and understand the beauty of nature.